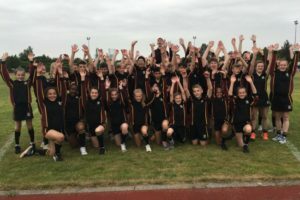 The annual Preston City Athletics competition took place on Tuesday, 19 June. The girls’ team had great depth in both the Under 13 and Under 15 age categories. We had many individual winners throughout the course of the day. Ellie Sumner, Angel Ojumobi and Anna Thompson won the 100 metres, Discus and 1500 metres respectively. This was a massive achievement as they were all Year 7 pupils competing predominantly against Year 8 students. Kelsey Corcoran and Grace Wignall also fought hard but narrowly missed out on a win, finishing a very respectful second place in the 200 and 800 metres. There were also very convincing wins for the under 15 girls, Annie Duffy in the 800 metres and Emily Mayson in the 1500 metres. In addition, Elodie Chesworth finished joint first in the Discus. Emma Clayton and Grace McGarvey also finished second in the 100 and 200 metres respectively. The boys’ team also worked extremely hard, each pupil giving maximum effort in their individual events. All field events took place in the morning and many members of our team threw or jumped personal bests to win their event. These included James Lupton (discus 42.35) and Liam Corless (triple jump 10.95). The Under 15 middle and long distance runners dominated their events with many pupils winning their event comfortably. Matthew Farrell ran a very tactical 300m final, saving his energy for a brilliant sprint finish to win by 5 metres. Cian Hayes, Tom Durney and David Alker also won the 800m, 1500m and 3000m respectively. All three maintained their lead throughout the race and were too strong to be caught by any opposing competitors. Laim Burns (long jump), Owen Strickland (shot putt) and Harvey Joliffe (javelin) all finished in podium positions which also helped give Our Lady’s boys’ team a convincing win in their age group.